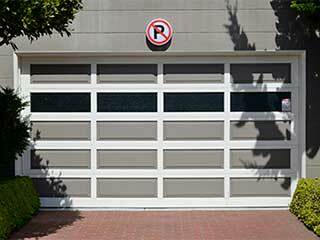 You may not realize it, but your garage door can say a lot about your house. It can be shabby and not well kept, or it can be clean and well preserved; each will tell a different tale. Not only that, there are certain aspects of your property, like security and insulation that can be greatly enhanced by having a modern door installed. Here are a few of the different benefits that this type of door can offer your home. One of the clearest examples of the benefits a garage door can offer you is very obvious. It can improve the curb appeal of your home. Beautifully designed wood can offer it a classic wholesome look, while a stylish steel door may present a vault-like sturdy appearance. The options are plentiful and limited only by your imaginations. There are additional decorations that can be hung or attached to the surface of the panels in order to distinguish your home even more from the rest of your neighborhood. If you're looking to sell your home or to be the envy of your cul-de-sac, then a new garage door has a lot to offer you. Unfortunately, we don't live in a perfect world. The reason why garage door security technology has advanced so much in recent years is because there was a need for it. They say necessity is the mother of invention, and that certainly is the case here. Nowadays your door could use rolling code technology which will prevent tech-savvy thieves from getting in, or it can be connected to motion sensor lights and even your home alarm system. Many people store all sorts of valuables and personal belongings in their garage, not to mention their car, so it's important that your door provides adequate security for your home. Speaking of stored belongings. The weather conditions outside of your home, mainly moisture and temperature levels, can come to affect things inside your property. If you want the things that you keep inside your garage to be properly protected from the elements, you need the door to be weatherproof and insulating. This isn't just for physical objects, it's for your sake as well. An insulated garage door will make staying inside the room a lot more bearable during the cold winter months or the hot summer season. What's more, it will also reduce heat transfer, which means your HVAC unit won't have to work as hard to maintain your desired indoor temperature. That comes down to less money spent on energy and more money spent on whatever you'd like. As you can tell, an automatic garage door system has a lot to offer you and your home. Some problems may occur, however, as is the case with any complex mechanical system. When you find yourself in need of assistance, don't hesitate to contact our team at Garage Door Repair Deer Park. We're always happy to help.